There is a running (but gentle) competition between my son and my SIL as to which of them is the best chef. Needless to say, that includes BBQ foods as well. So this card will end up being a birthday card for one of them, but I'm not sure which at this point. I put the birthday sentiment on the inside. 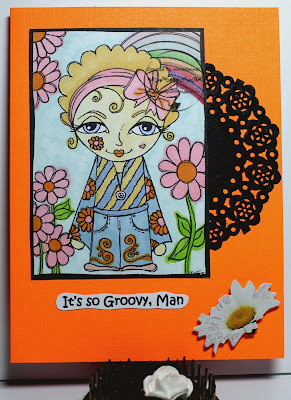 her card this month in the Card Chain Challenge exchange. 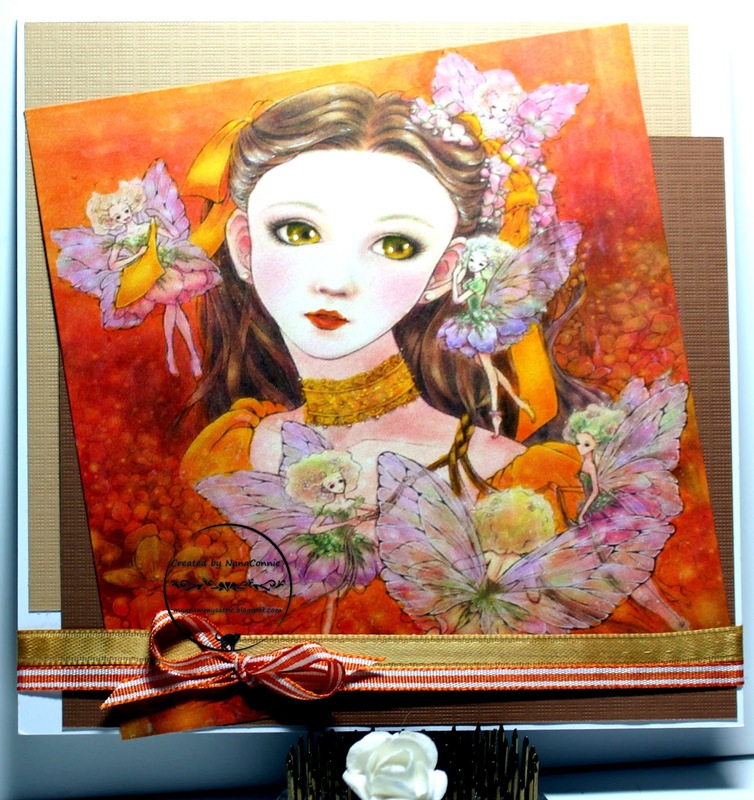 Sharing another autumn card with a delightful image from Beccy's Place. I think it's called Autumn Window but it's in the set of seasonal windows Beccy has done. I love all four of the windows in the set - one for each season. 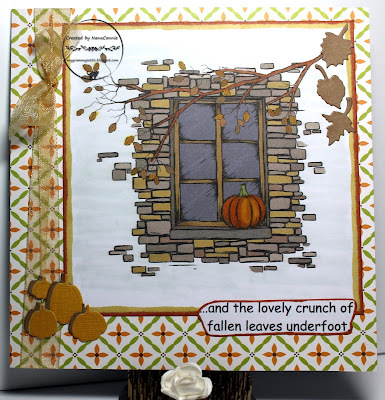 I've used this fall window a couple of times before but each time I color the stonework differently. This time, I used dull yellows, browns, and grays. I colored it with my ProMarkers, using the ultra fine tips for the branches and the smallest leaves. 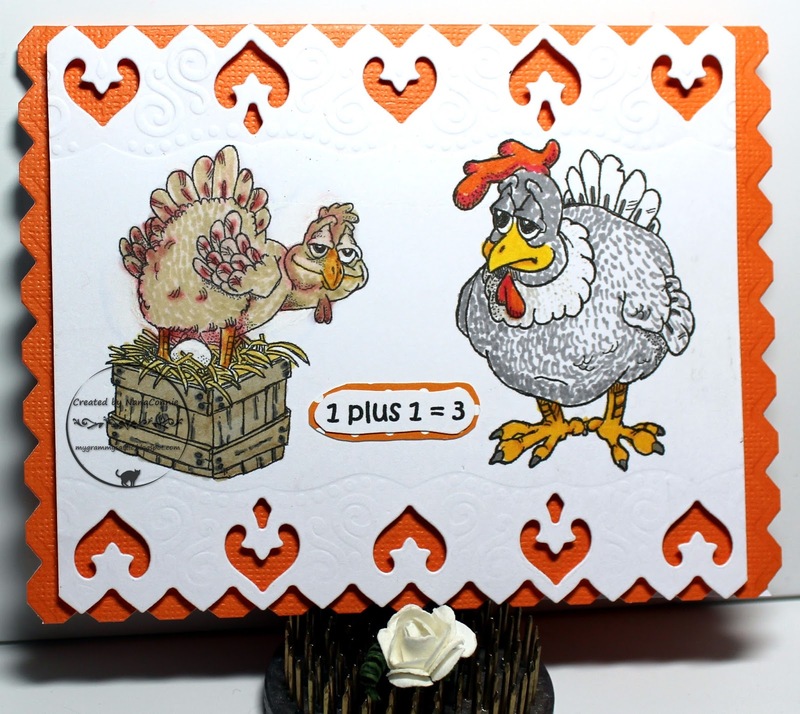 I cut it with the largest square die in the first die set I ever bought from Spellbinders. I inked the edges twice to make it look matted and layered it onto patterned dp from Jillibean Soup. Then, I did the sentiment, printed and hand cut. 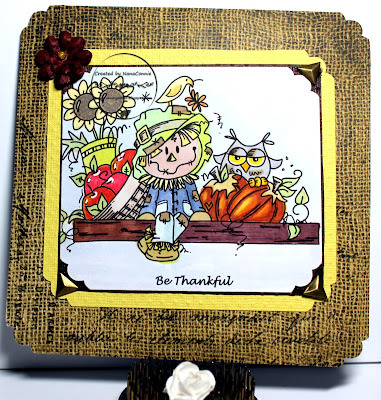 For simple embellishments, I used pumpkins in the lower corner (cut with dies from Impression Obsession) and leaves in the upper corner (cut with a die from Dies R Us.) I added sheer beige ribbon which I tied by hand. I shared my embroidered kitten with you last week and promised you more cards with appliques as I got them made. This one today was done using the very first patterns I tried on the new data card for my sewing machine, but these are not the first samples I did. For these, I invested in some spools of variegated embroidery threads which I used for the stems and leaves. The darker threads in the pink and yellow flowers were done by using the computerized program and changing the thread when the program stops and tells you to change thread. Very simple and those two parts of the program were done last. No coloring, obviously, but I adhered two colors of CS together, then cut them as one piece with a stitched die from Die-namics. I used fabric glue to adhere the embroidery to that. 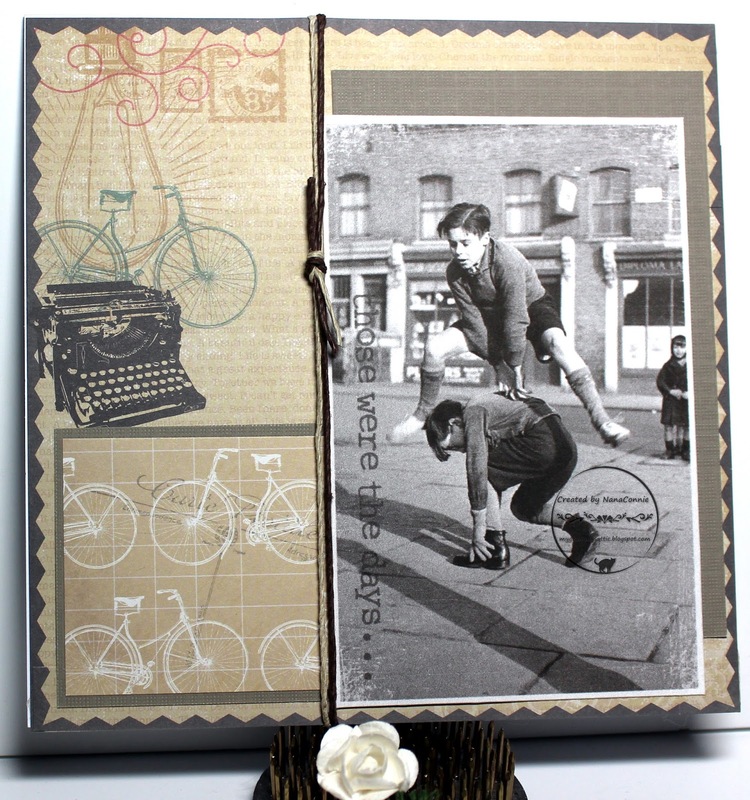 The background dp came from the Whimsy stack by DCWV and I wrapped it one time with a narrow, green ribbon. I added one of my hand sewn bows and it was complete. I didn't want anything to take away from the shine of the embroidery. I have a couple of posts scheduled for this week but the big day will be Friday when I'll have a total of 4 posts! All of my DT work seemed to fall on the same day this time although only one is a regular Friday post. The others were either for the 1st of the month or the 1st Friday and this month, they all came together on that day. Another Friday, another QKR Stampede "Anything Goes" challenge but, as usual, we also have an optional theme if you want to use it - "Any Sport with a Ball." 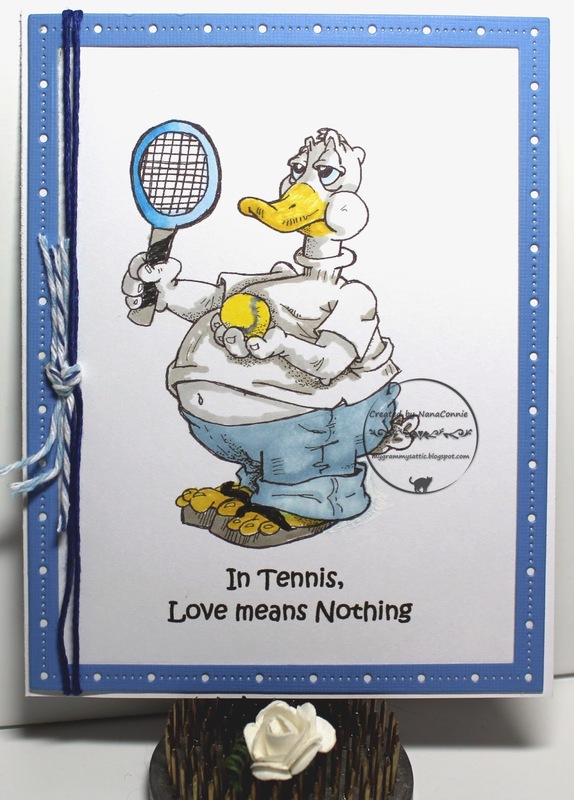 I thought "Tennis Duck" was a perfect image for that theme and grabbed him from the shop as quickly as I could. I printed the image and sentiment right onto the card front. 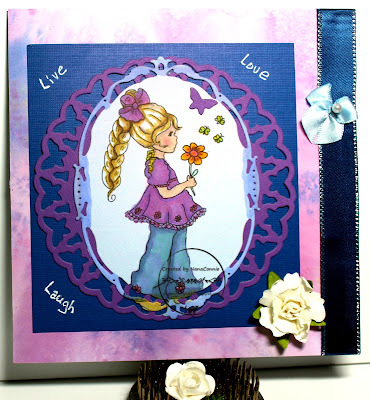 I used chalks and ProMarkers to color the image, then cut a blue frame with a Gina Marie die. 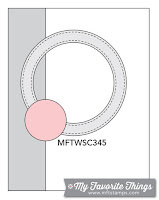 The frame is laid right on top of the image making it look like two or even three layers. I wrapped jute cord around the card front and tied baker's twine around the cord. This is my first attempt at 'teabag folding' on a card and it's time consuming but something I will no doubt try again since I really like the end result. I used a die cut, CS frame made by using two dies from a Spellbinders set and all the papers are layered onto it from the back. All the papers came from a card kit which had been in my stash for at least 4 years. 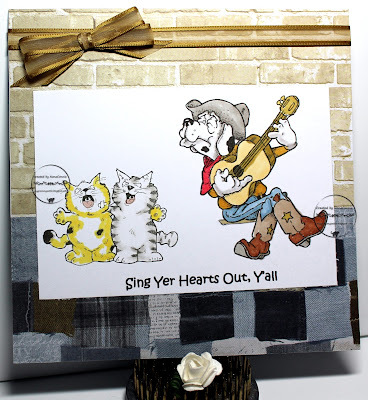 I never did make any of the suggested cards, but at least the papers and one of the the sentiment pieces were used here. Once all the papers were layered onto the back side of the frame, I added dimensional foam tape to adhere it to the card front. 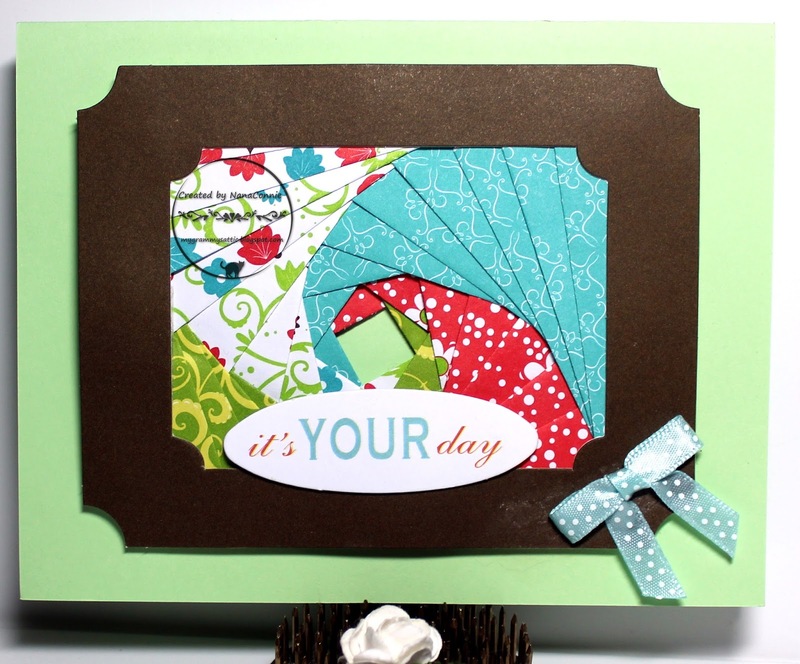 I added the sentiment and the polka dot bow and left it alone, wanting the focus to be on the folded papers. For those of you who question whether or not I know it's only August, yes, I do know. Despite that, I posted my first Thanksgiving card on Monday and today I have my first Halloween card. But I was a winner in the FB challenge at Sasayaki Glitter and chose this image as my prize. Then I just couldn't wait to get it colored up and made into a card. 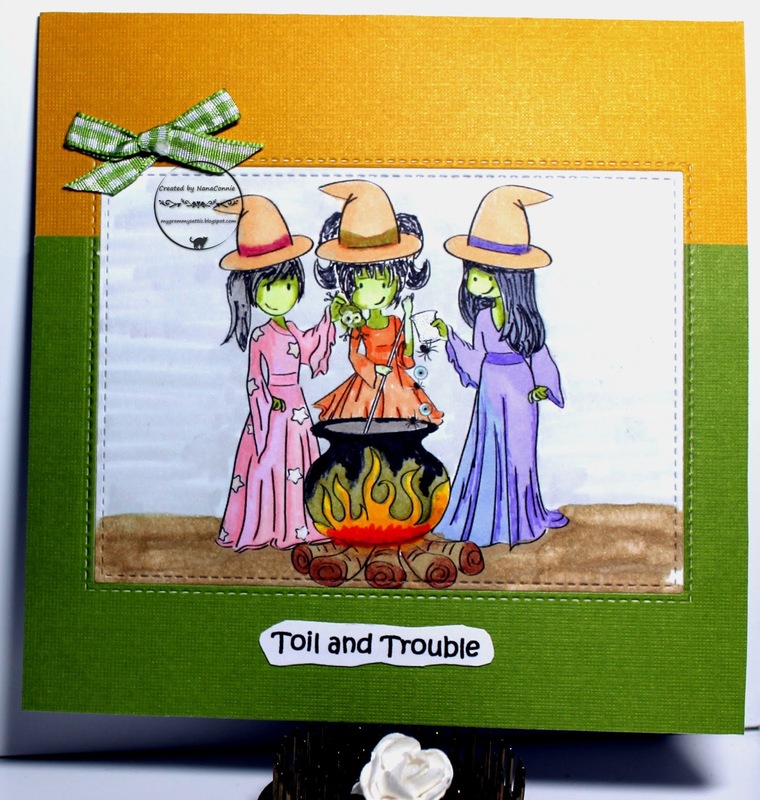 :-D It's called "MacBeth Witches" and it makes me think of the Hogwart's Choir singing "Toil and Trouble" in the first of the Harry Potter musical scores, a favorite of mine. The theme at the Sasayaki Glitter blog challenge is "Colors of the Rainbow" so I did my best to use as many colors as possible, while still having a Halloween color palette. I used a combination of ProMarkers, chalks, and polychromos pencils to color. I cut the image with a stitched, rectangle die from Die-namics. I layered together two scraps of CS, then used the same die to cut a window in which I inlaid the image so it becomes all one layer. I added the sentiment and a small gingham bow and called it finished. A delightful CAS design which will be easily mailed. 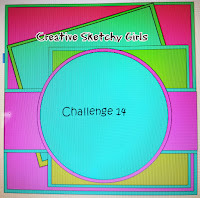 I'm doing a second post today because I'm running out of time to get this entered into the challenge at Aussie Digital Artists and I'm using their freebie offered by My Stitch Back in Twine. Since I was a California girl back in the "Flower Child" days of the 60s and 70s, I just couldn't let August go by without doing something with this image! I printed the image onto cardstock and then used my watercolor paints to color it. I cut it with a simple rectangle die from Spellbinders. In keeping with the time period, I used neon orange CS to make the card base. I added the black doily, the sentiment, and one, sparkly daisy adhered with Pop Dots for a touch of dimension. 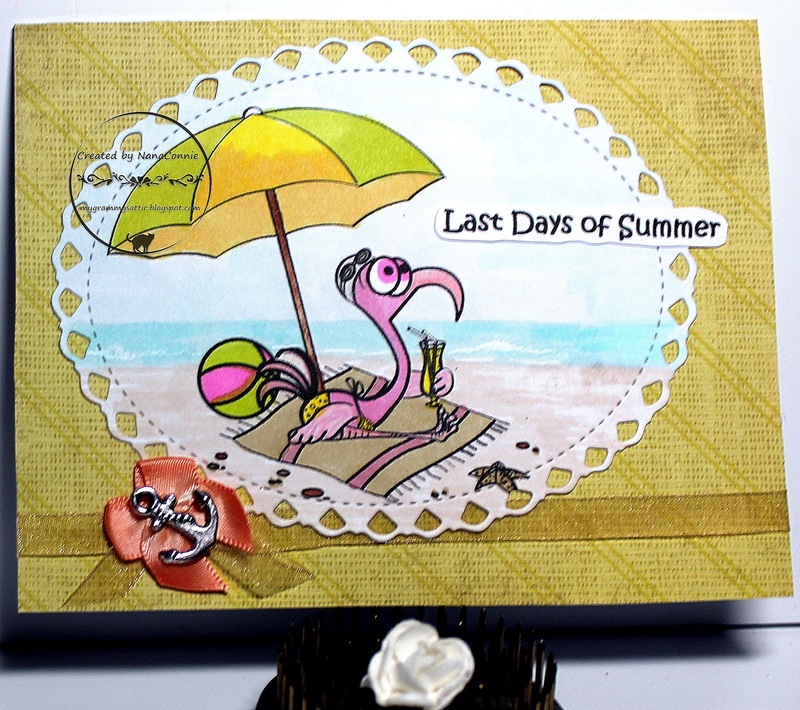 It's a sure thing that summer is coming to a close when you find only one flamingo on the beach, looking for that last drop of sunshine to tan his pink feathers. Or maybe all the rest of them just got scared away by yesterday's solar eclipse? I used colors from the Ellen Hutson Pin Sights challenge. The image is from the Sasayaki Glitter FB progressive challenge. I colored with my ProMarkers and cut it with an Unbranded die. The paper is from an old DCWV stack. I printed the sentiment and fussy cut it. I added ribbon from my stash, plus one of the bows I make up by the dozens and have ready as needed, and found an anchor charm which seemed good for the beach theme. Well, I keep telling myself it's almost fall and that this hot, hot, hot summer will finally be over. I'm trying to hurry it along by doing cards appropriate for fall and the holidays like Halloween and Thanksgiving. This week, I'll share my first cards for each of those. Here's one for Thanksgiving. at The Outlawz Color Challenge. 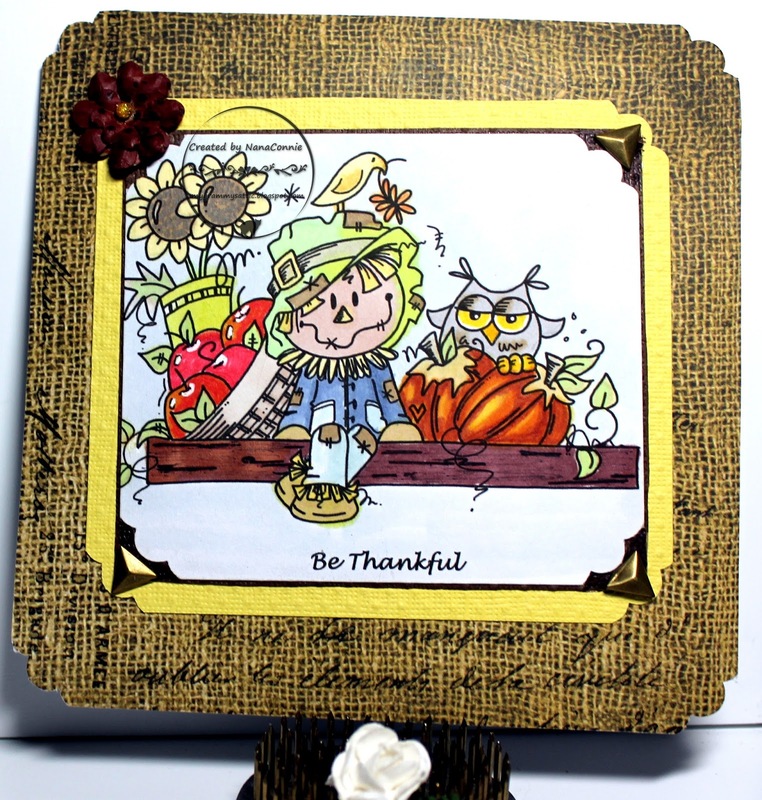 This adorable image with the scarecrow and the owl is from Bugaboo Stamps and I'm entering their Bingo challenge by using the top row (gem, red, brad.) I colored with my ProMarkers, then cut the image with a plain, square die (Spellbinders) and used a corner punch on it. 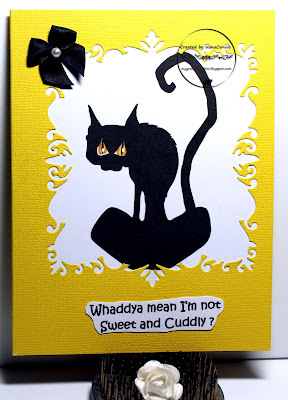 I die cut another larger square piece from yellow CS and used the same corner punch on it. I put the image onto dark brown CS, then added that piece to the yellow mat. I found some metal, triangle brads and added them to three of the corners. I used burlap paper from my stash to make the card front, and then decided to use the same corner punch on the card itself. When it came to embellishment, I added the paper flower with a gem in the center and called it finished. Hmmmm, chickens on Friday and cats on both Saturday and Sunday! But then, I love cats -- and I love Sami Stamps, and I love card making so this one was a natural. It also reminds me of Honey Cat (see sidebar) who has gotten rounder and rounder and rounder and still gives me 'that look' ! 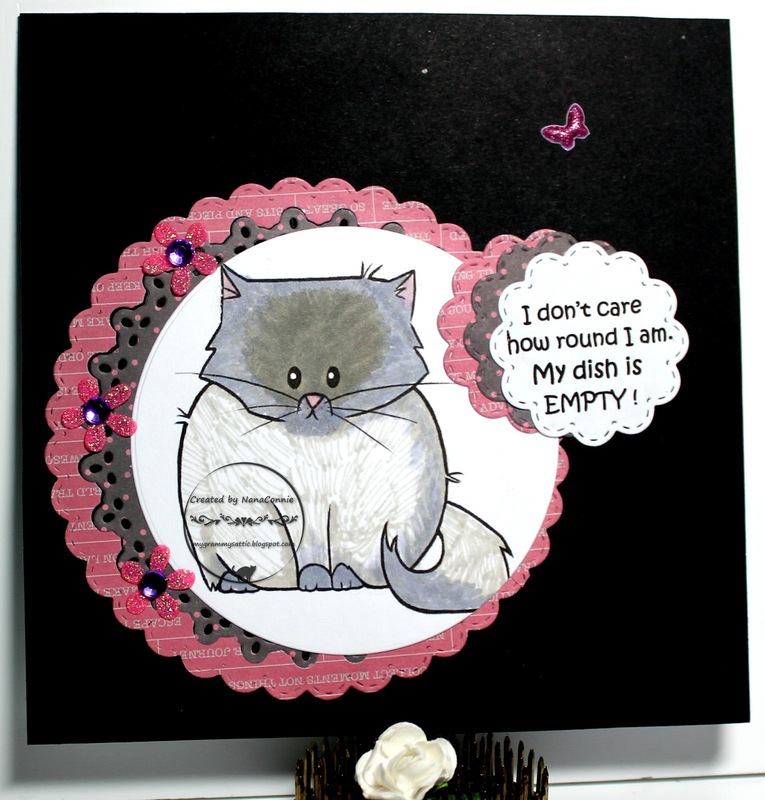 I colored Fat Cat, excuse me, Round Cat with my ProMarkers and cut the image with a simple circle die from QuicKutz. 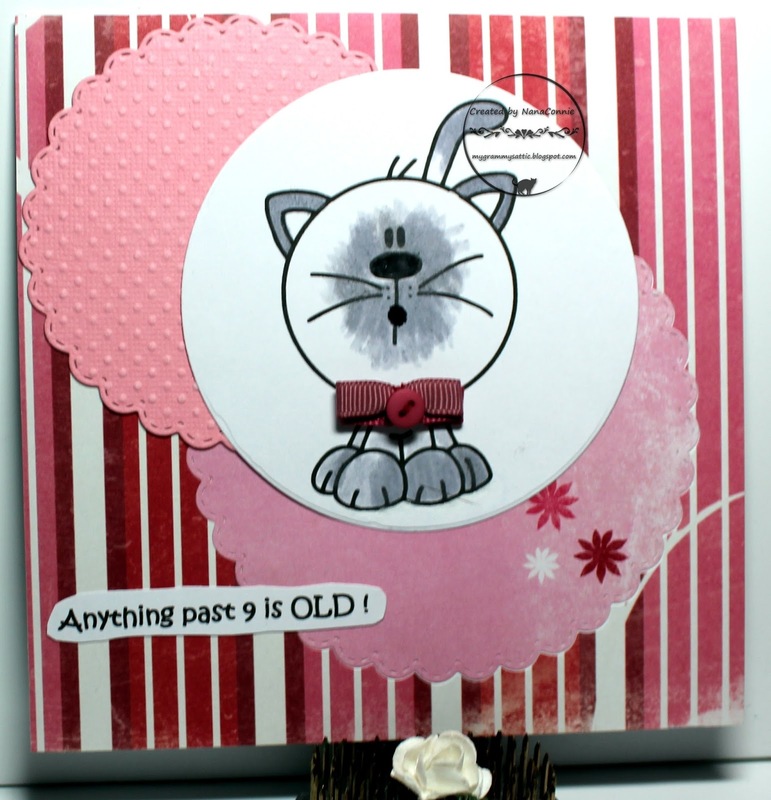 I used another QuicKutz die to cut the polka dot dp and a Memory Box die to cut the bright pink dp, then inlaid them behind the cat. The sentiment and both matting pieces behind it were cut with a smaller die from that same Memory Box set. For the last 7 years or so my once-beloved sewing machine has taken a backseat to my paper crafting. In fact, when I moved nearly 4 years ago, I left the embroidery attachment and the quilting kit packed away although I did unpack my actual sewing machine. I've done a few things with it, mostly Christmas projects, but for the most part it has been tucked away in a corner, sad and lonely. Last weekend, I dug out the embroidery attachment because I had been given a new-to-me data card for the machine, filled with cute animals and insects and flowery patterns normally used for dressing up kids clothes or even household linens. What I hadn't thought about was the possibility of making embroidered appliques but after testing one or two of the small flower patterns on some scraps of muslin, here's what happened (see card below.) I think I may have discovered a new addiction (plus a way to combine my two favorite things - sewing and card making) !! What do you think? Once I had the machine set up and programmed with the data card, it took about 9 minutes for the machine to make the kitten; I had to change thread for the kitten's ears and again for the butterfly (twice). But it took me longer than all of that to hand cut the applique with scissors (Note to self - get your tiny embroidery scissors sharpened!) keeping the kitten and butterfly all together as one piece. Obviously, the "coloring" was done with the various threads instead of my usual markers but I did have to choose the threads. Once it was cut out, I used white fabric glue to attach the applique to some scrap CS, then trimmed that to fit. The CS acted as a stiffener so that the kitten wouldn't curl. I die cut the scalloped circle with a die from Memory Box and the scalloped frame was cut with a Sue Wilson die, then run through my 'Linen" embossing folder. I glued the applique to the circle, then layered it onto the Sue Wilson piece, and all of that went onto a piece of dp from the Linen Closet stack by DCWV. I chose papers that had beautiful Wedgewood blues to compliment the blue-gray of the kitten, but in the photo the blues look more "sky" blue. That post title will probably tell you that I'm not all that good at math but my card will tell you that I definitely know how to count my chickens! I used a combination of Copics, ProMarkers, polychromos pencils, and gel inks to color the combined images. I used a border die from Spellbinders to cut and emboss the image piece. The card itself is cut with a die from QuicKutz. The image piece is mounted onto dimensional dots. The sentiment is printed, hand cut, matted with a scrap of dp, and hand cut again. 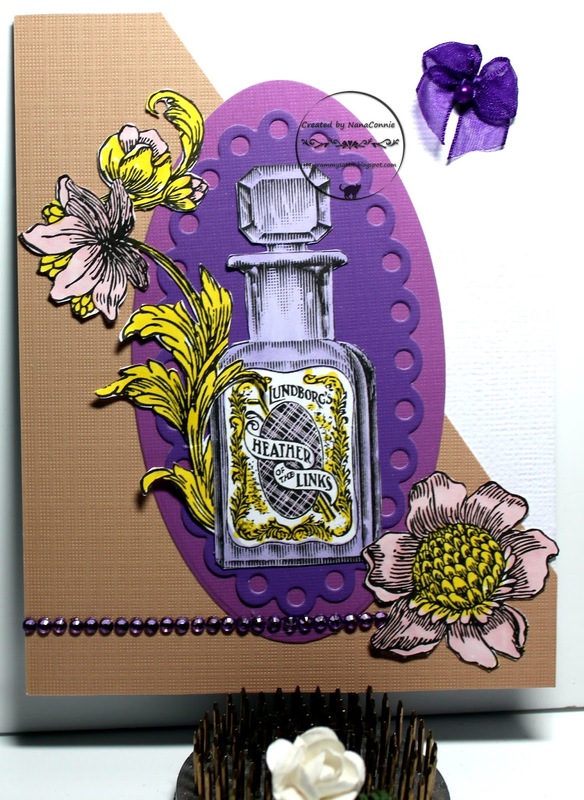 Fairly CAS card but for the die cut borders making it look more complex. I love Rick St. Dennis images and the whimsy he builds into his images of critters large and small, but especially his sassy felines. This is an image I've had for a while but somehow never used until now. 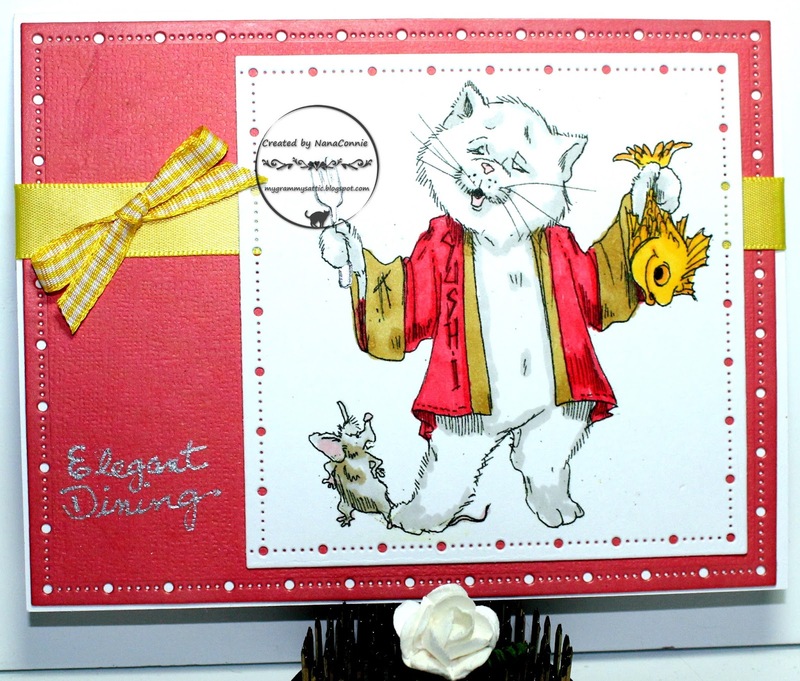 Based on Tomcat's fine, silk, smoking jacket and silver fork, I just know this is the best there is in a feline's elegant dining! 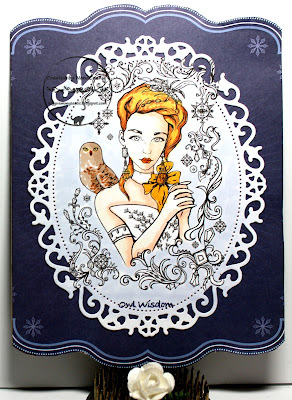 I colored with my ProMarkers and then cut the image with a stitched die from Gina Marie. The dies from that set are all rectangles, but I shifted the die over, cut a second time, and got a square for the image. I cut a simple rectangle for the red CS background and added golden yellow, satin ribbon before mounting it onto the card front. I tied the gingham bow by hand and then heat embossed the sentiment with silver EP. Summer has been hot, hot, hot where I live with nearly twice as many 100F + temperatures as what we normally have but I will say that means we have a bumper crop of juicy berries at the farmer's markets this month! I decided to celebrate that fact with this cute little card featuring a Blueberry Sprite from AuroraWings. and the colors from House of Cards. I colored the sprite with my ProMarkers and added some gel ink highlights. I cut the image and the two smaller circles with stitched, scalloped dies from Memory Box. For the background, I started with a piece of dp that had polka dots, then did a water color wash over it, changing and blending the colors as I went. After it was dry, I spattered water droplets across the top, moved them around a bit by tilting the paper back and forth, then let it dry. The result is the water spot marks in the top corners. They are on both corners but the right hand corner is so light it doesn't show in the photograph. After the background was completely dry, I ironed the paper to flatten it, then added a strip of deep, purple ribbon before adding the die cut circles and the image piece. I hand cut the printed sentiment, then added the sheer bow. I'm going to start this second post of the day with some wonderful news, kind of unexpected but delightful. I was chosen to be on the Design Team at Createful Hearts! I applied, not really expecting anything wonderful (like being chosen for the team), and within a few hours of applying, I received an invitation to join them. I was so excited! 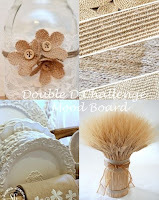 This is a brand new blog challenge, separate from and in addition to what you'll see on the Facebook page. The first challenge begins today, runs for a month until September 14, and the theme is everyone's favorite "Anything Goes." The DT is showcasing three different images today and mine is "Princess Annabelle." I adore this little ballerina. To see the other two images and what the DT have done with them, please go visit the blog, won't you? I used my ProMarkers to color the image, adding in the floor to make it an indoor scene. I cut it with one of my stitched dies from Lawn Fawn, and added a dark brown mat (piece of scrap.) The ribbon came from Really Reasonable Ribbon (also scraps left over from a previous project) and the striped background was a leftover from a 12x12 sheet of scrapbooking paper. I do love using up scraps! :-D I added dimensional daisies and pearls for embellishment and texture. I have strong Irish roots in my family tree and, while I've never been there myself, I remember one of my great-uncles sharing about the wonderful scent of heather when it was blooming on the 'moors' in Ireland. Every time I see this particular bottle image from MHK Designs (Beautiful Bottles set), I think of him. 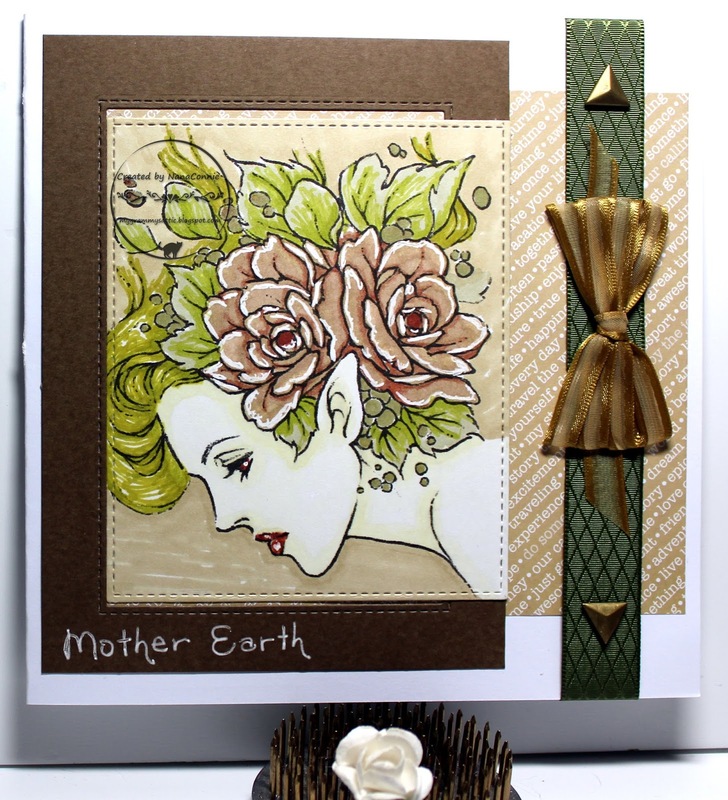 I also used flowers from another set by MHK Designs. I thought they really worked well together and provided exactly what I wanted for the sketch. I used my ProMarkers to color both the bottle and the flowers. I fussy cut all of the pieces and then used a die from QuicKutz (oval with scallops) and another die from Spellbinders (plain oval) to cut the framing pieces from (my favorite color) purple and lavender CS. but I flipped it side to side. I used my ProMarkers to color the image, then cut it with a die from Spellbinders. The circle die cut with the butterflies is also from Spellbinders. 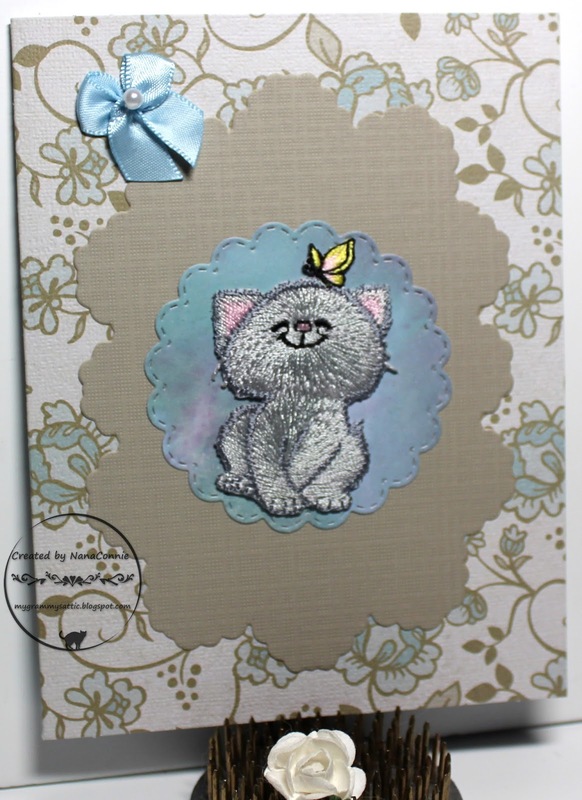 I layered those together and then added them to a scrap piece of blue CS which was embossed with my "Linen" folder. The pink, blue and purple background was done with alcohol inks which were sprayed with alcohol and left to dry, then ironed flat. 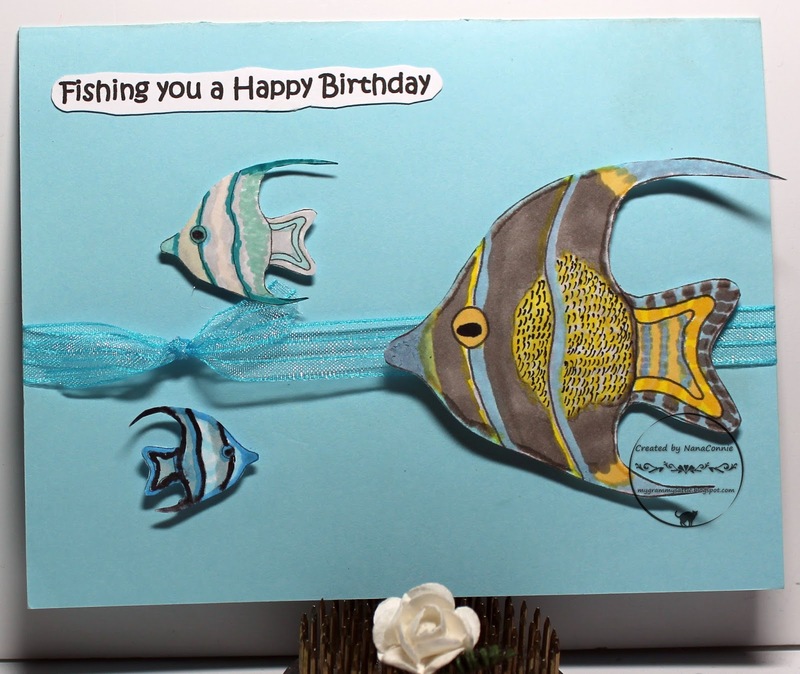 I added a shiny, silver-edged, royal blue ribbon to it and mounted it onto the card front. The sentiment(s) was heat embossed with white EP. I added one white rose and the tiny blue bow for embellishment. I love the challenge theme at AuroraWings this month - Be Inspired by one of the 4 Elements: Earth, Air, Wind or Fire. I chose this wonderful AW image "Enchanted Visions" and did it in the colors of fire. This one is based on the sketch from Creative Sketchy Girls. The background is done with watercolor paints and the girl and fairies are colored with my ProMarkers. I had to be very careful with the watercolors around the fairy wings but it worked out OK. I cut everything into squares; the image, both background pieces and the card base. 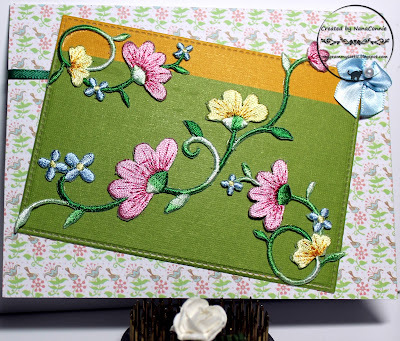 I embossed the two CS pieces with my Linen folder, then arranged everything on the card front. I wrapped it all with two ribbons from my stash and tied one of them into a bow. I didn't do any sentiment because I thought the image spoke for itself. It's Friday again so you probably know what that means if you visit my blog regularly. :-D This week at QKR Stampede we're giving you an optional theme of "Music" but if you don't want to use it, you're welcome to just enter under our usual "Anything Goes" theme. 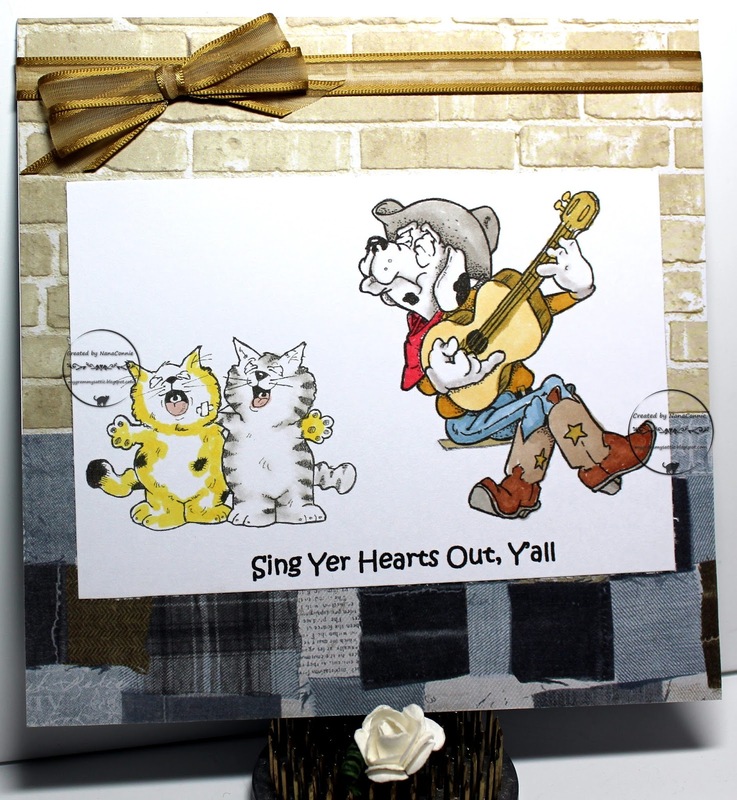 I had two favorite musical images and couldn't decide between them so combined them into one card; "Cat Calling" and "Country Crooning." Now they look like they're having a party, don't they? I colored all of them with my ProMarkers and cut them with a plain rectangle die from QuicKutz. Both background papers came from an old Recollections stack and the ribbon is from Really Reasonable Ribbon. I did it as a pretty CAS design because I knew it would end up in my stash of masculine cards. 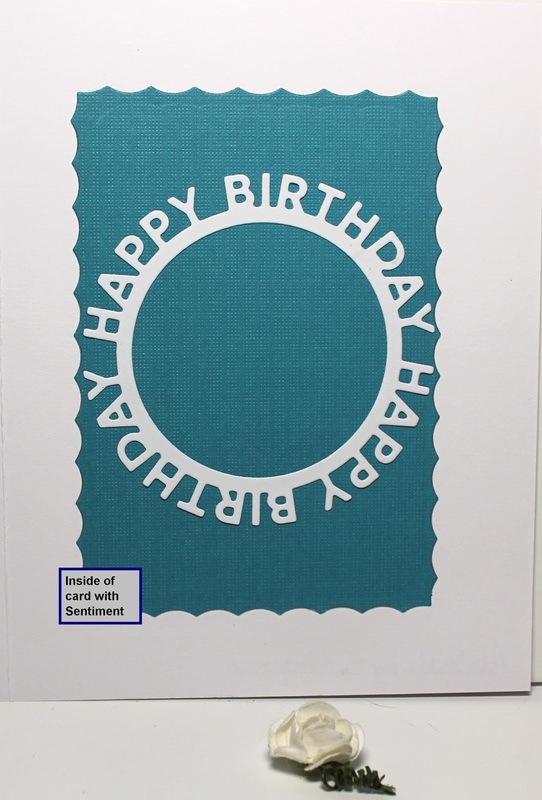 This is actually a 'window' card in that the card front is die cut (Memory Box), leaving a scalloped hole and the image is on the inside of the card. I colored the image with my ProMarkers, trimmed it to the size of the A2 card and mounted it on the inside. I printed the sentiment, fussy cut it and adhered it to the card front. 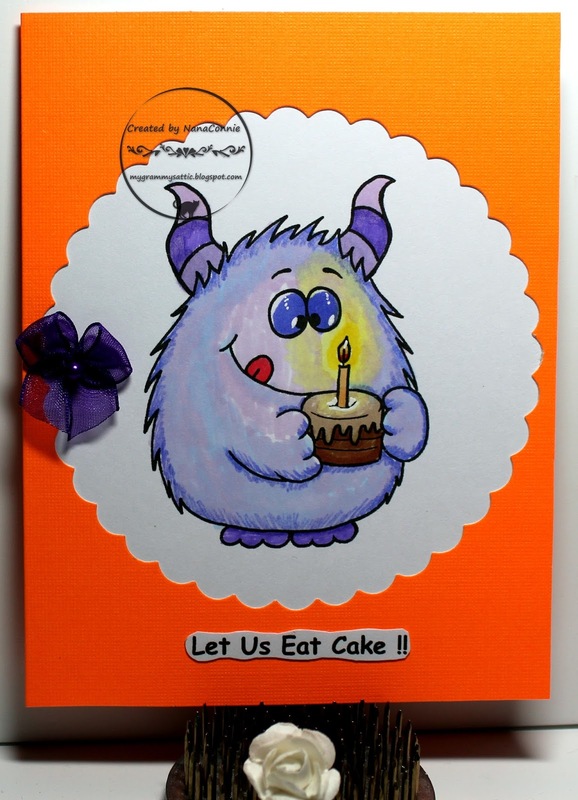 This is another ombre card front. I bought a stack of ombre CS in various colors and I'm having a lot of fun using them for card bases. 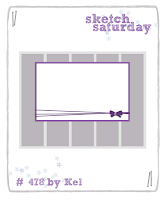 This time, I decided it only needed minimal embellishment, so I added the sheer, purple-ribbon bow. Because there wasn't a lot of room along the sides of the window, I added a small tab sticking into the window and then adhered the bow to it so that the tab was hidden by the bow. I'm an animal lover and cats seem to adopt me more than any other animal right now so I'm becoming known as a crazy cat lady. I share that with all of you so that you'll have it in mind as you read the rest of this post that I'm not anti-feline. 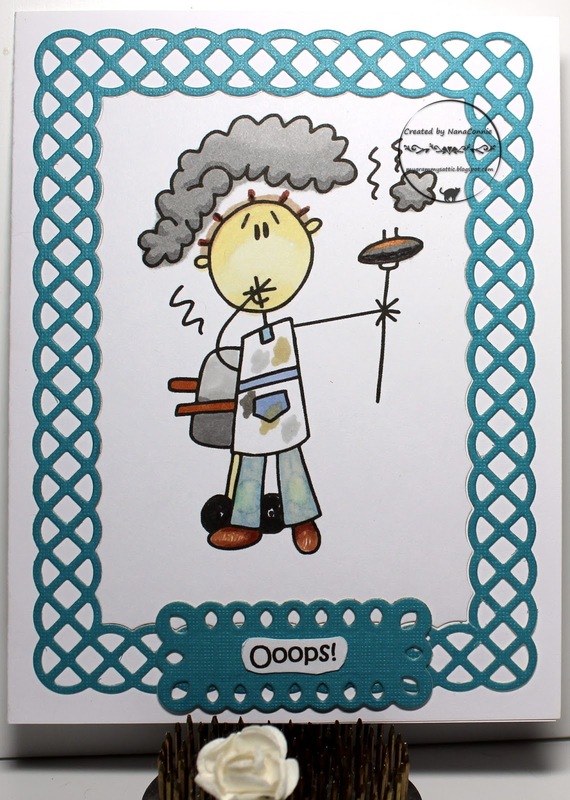 This cute and funny image from Beccy's Place will show you exactly what I mean. I know this is meant to be a Halloween image but it's versatile enough to work for any time of year. Your eyes are not fooling you - the card base is made from yellow ombre CS which I ran through my "Linen" folder. I adhered the image to the inside of the card front, then added the sentiment to the outside along with a single black bow. Finished! I just love this "Winter Fairy" image from Fabrika Fantasy with the wise owl on her shoulder! Of course, I'm pretty much crazy for any of their images so that wouldn't be hard to figure out but my daughter loves owls. Whenever I run across one in my stamping world, I grab it and make up a card just for her, often for no specific occasion. This time I've done another shaped card, fussy cut to match the design in the background dp. The image and background 'sky' are done with water-colors. 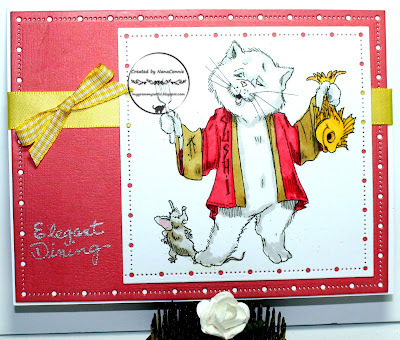 I used a die from Spellbinders to cut the image and then layered it directly onto the background dp. No added embellishment so it's a very CAS design but one which looks very complex because of the delicate die cut and the soft pattern in the dp. 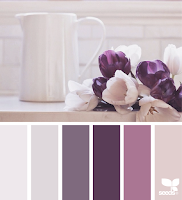 I was inspired by the colors I found at Sugar Pea Designs. I printed the angel fish three times, in different sizes, with one of them reversed. They're all colored with ProMarkers and then fussy cut. I used a blue card base because it was a perfect color to represent water. I got the sheer, sparkly ribbon out of my stash, wrapped it around the card front and tied it into a square knot. 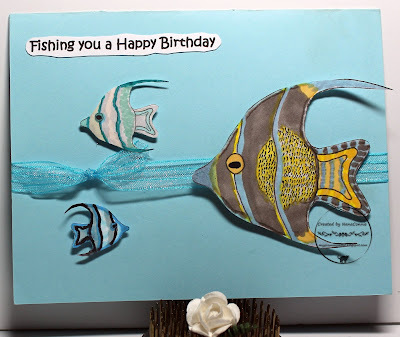 Then I mounted the fish using Pop Dots. The final touch was the printed sentiment. Clean, simple, masculine, and easy to mail. One more birthday card for my stash. That's all I have for today. I may even venture outside today since the weather predictors are saying that we're going to have a wonderful "cool down" on our temperatures. They don't expect it to get above 99F !! And if tomorrow only gets to 98F (as predicted), then we will have ended our 3rd heat wave of the summer which only ran for 18 consecutive days this time. The record setter was in June when we had a 19 day heat wave, the longest in recorded history for our area. 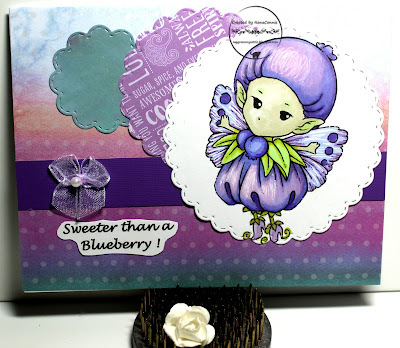 The image is from the Progressive Challenge on Sasayaki Glitter's Facebook site. It's called "Baby Boy with Monkey." and colors suggested by Double D.
I colored him with my Promarkers, then cut him out with a hexagon die from QuicKutz to match up with the hexagon paper I had chosen. The patterned papers came from Recollections and everything was matted with dark chocolate CS. The card front was embossed using my "Linen" folder and I added the two pearls for some simple embellishment. They also give some great texture, as do all the layers. My card this morning is a salute to a very astute, 6-year-old who has four older brothers (ages 13 through 21.) She's the only girl and the baby of the family, a completely unplanned 'happy'-stance, and wonderfully unspoiled despite being everyone's darling. :-D The sentiment is an exact quote - directly from her. 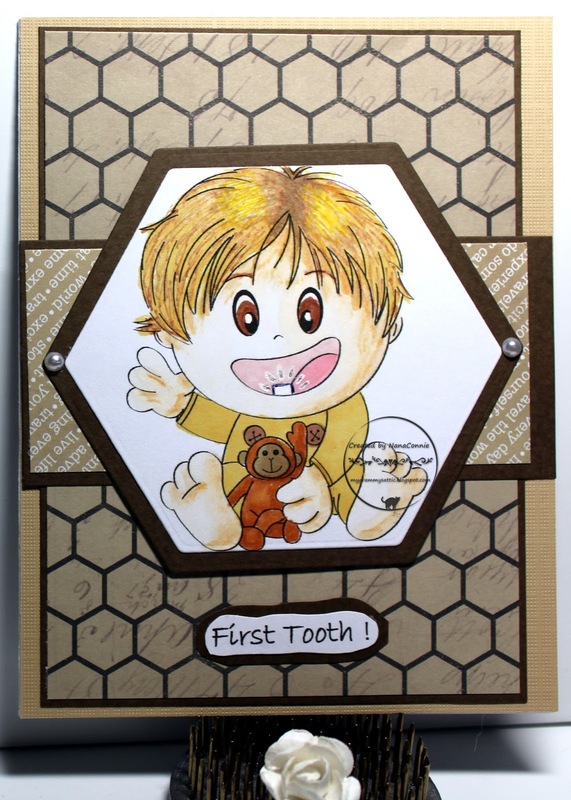 I colored this adorable Bugaboo Stamps image with my ProMarkers and followed the recipe from Catch the Bug Challenges (3 layers, pink, and scallops.) The striped dp and the distressed pink dp (cut with the same Memory Box stitched, scalloped circle die) are inlaid so that's really a single layer. Then I cut another scalloped circle, smaller this time, and embossed it with my Swiss Dots folder. Finally, I added the image which had been cut with a plain circle die (QuicKutz), making the other two layers for the recipe. I used two different grosgrain ribbons to make the bow tie and sewed on a tiny button. What you need to know is that Dollie, the 6-year-old, has a 5-month-old, Siamese kitten and he wears a red collar with a bow on it that looks like a bow tie. I thought that made this card perfect for her and I'm sure she'll get a kick out of it when her own birthday rolls around in September. IF YOU'RE LOOKING FOR MY DT POST FROM EMERALD CITY CRAFTS, PLEASE SCROLL DOWN ONE POST. New challenge starts today over at QKR Stampede; Anything Goes with an optional twist of "Humor." Every unicorn I've ever seen (?) is young and spritely so I never thought about what happens when unicorns reach their "golden years." However, QKR Stampede made me think and that gave me a completely different perspective! Check out what I did using this delightful image called "Unicorn and Butterflies." 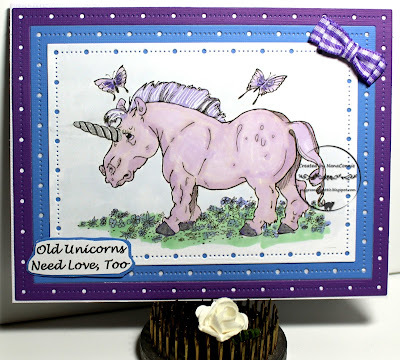 I colored with my ProMarkers (unicorn and ground), chalks (sky and butterflies), and sparkle gel ink (unicorn's horn and hooves), then cut him with a die from Gina Marie. I also cut two layers of colored CS using larger dies from that same set. Although the middle layer looks blue in the photo, it's actually a deep periwinkle/lavender. I added the sentiment and a small, double layer, bow-tie bow made from gingham fabric. CAS design even with the 3 layers, and looking rather masculine with only minimal embellishment. Welcome to a hot August! I got home from my trip to the beaches of San Diego only to find hot and very humid, weather. Yuck!!! Usually we have dry heat which makes it a tiny bit more bearable. I started with the sketch I found at Stella Says Sketch. I debated about coloring this one but, in the end, decided that good, old fashioned, black-and-white with sepia, my favorites for vintage cards, was just perfect. The papers are from a Recollections stack but I don't remember which one. I do love the contrast of the circles in the bicycle wheels with all the rectangles and squares of the card design. I matted each piece with embossed CS (used my very old and very worn "Linen" folder) and added jute cord for the embellishment. I hope you're going to come play with us this month. Our challenges begin on the 1st Friday of the month, run for 3 weeks then close, and winners are announced on the following month's challenge post. So this month, you have until August 24 to get your entries in. Be sure to stop by again in a few hours when my weekly post for QKR Stampede will be posted.